Did Tim Fasano Film A Skunk Ape? As most of you know Tim Fasano spends a lot of time in the swamps and woods of Florida. 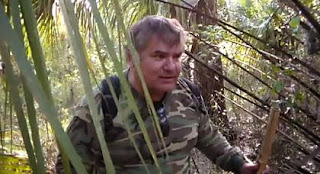 While filming in the bush he captures a bi-pedal figure moving swiftly through the trees.
" This is from a much longer video that shows a black, upright walking primate animal. It is close and moving a good clip. Kevin and I are a long way from saying this is Bigfoot. Our time is limited but an investigation is ongoing. To just leap ahead and claim some unclear video, which could be anything, is just not what we want to do. We are real Sasquatch investigators." It was his good friend Rick Dyer.